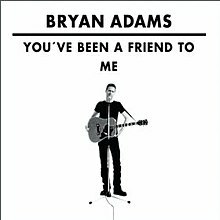 (2008) "You've Been a Friend to Me"
(2009) "One World, One Flame"
"You've Been a Friend to Me" is a rock song by Bryan Adams. The single was released worldwide in December 2009. It is the theme song for the American film, Old Dogs. A video was made featuring Adams playing various members of his band with disguises, such as wigs, eyeglasses, and different clothing. Adams also directed the video. A new mix of the song was included on the deluxe version of his 2014 album, Tracks of My Years. ^ "Bryan Adams on YouTube". youtube.com. Retrieved 2012-10-19. ^ "Canada: Adult Contemporary". Billboard. Retrieved August 12, 2010. This page was last edited on 13 January 2019, at 18:51 (UTC).